Titanic Facts for Kids -in these facts about Titanic ship in our research we have tried to pull the information together in an accurate and informative way. RMS Titanic was built in Belfast, Northern Ireland. There are many memories and facts about the Titanic ship that reside in Belfast none more so than in a tour of the newly built Titanic Belfast visitor attraction which is proving to be the most visited tourist attraction here. 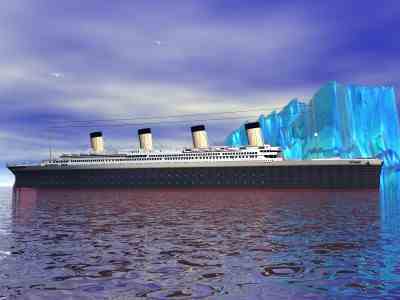 For now we hope you enjoy this Titanic information page on the history of the Titanic and facts about the Titanic ship . They start at the very beginning from the Titanic Construction right up to the present day. White Star Line was the company that built the Titanic ship , owned by J.P. Morgan, an American tycoon. 401 - the yard number within which the Titanic was built, at the Harland and Wolff shipyard in Belfast. 14,000 - the number of men employed at the Harland & Wolff shipyard. £2 - the weekly wage of a Harland & Wolff construction worker. How the Titanic was built involved 3,000 men two years to build the ship. Three million rivets held its massive hull together. There were 4 funnels (smoke stacks), only 3 were operational. The 4th funnel was for looks. As the Titanic ship was leaving the port, the suction it caused actually snapped the ropes of a nearby docked ship, (The S.S. New York). Tugboats had to race to the scene to prevent the New York from colliding with the Titanic. There were 6 ice warnings received by Titanic ship on the day of the collision. They were all ignored by the wireless operator who was preoccupied with transmitting passenger messages. The iceberg that the Titanic ship struck was not a very big one. It did not even come up as high as the bridge of the ship. The iceberg that the Titanic ship struck was unusual in such a way that it was not white like most others, but more of a clear look caused by continuous melting. The clear surface in effect reflected the dark night sky and water like a mirror, thereby making it a black object, almost impossible to see from a certain distance. The term for this kind of iceberg is "blackberg", and is similar to the black ice found on cold icy roads. An iceberg exposes only 1/10th of it's mass above water. With the other 9/10ths of it's mass below water. It makes them impossible to budge. Even with a force of a ship like the Titanic. Some facts about Titanic ship answering the question when did the Titanic sink? The Titanic ship was traveling 22.5 knots while cruising through iceberg laden waters. Just .5 knot from her maximum speed capability. The collision occurred at 11:40 P.M. on Sunday, April 14, 1912. Murdoch had ordered the engines reversed which had, ironically, sealed the Titanic's doom. Like all ships, the Titanic turned more quickly the greater her forward motion. Had the Titanic proceeded ahead and turned, it is most likely that she would have avoided hitting the iceberg all together. The gash that the Titanic iceberg cut into the hull of the Titanic was between 220 to 245 feet long. The total length of the ship was approximately 882 feet. Though the damage in the hull was 220 to 245 feet long, the most recent evidence shows that there was only a 12 square foot opening (the size of a refrigerator) in the hull allowing water inside the ship. The "watertight" compartments of the Titanic's hull were not actually watertight. They were open at the tops, which aided in her demise. The Titanic ship could have stayed afloat had only four compartments flooded... Five became flooded. Where did the Titanic sink.It sank 400 miles (640 kilometres) off the coast of Newfoundland. The Titanic wreck lies approximately 2.2 miles (3.75 kilometres, or 12,600 feet) below the surface of the North Atlantic. The main sources to compile these fast facts about Titanic have been the Discovery Channel and National Geographic. Today Belfast remembers the facts about Titanic ship with its newly opened Titanic Exhibition in the Titanic Quarter of the city. There are also Titanic ship monuments erected at Belfast City Hall in its memory.